Today I am going to review a red lipstick from Revlon Colorburst range of lipsticks which I bought during a sale. I bought this lipstick from "Cosmetic Fragrance" store at Melbourne a while back and started to use only recently. Revlon seems to have discontinued this range of lipsticks in which there are 20 shades to choose from but these lipsticks can still be found at online shopping sites. The shade I am going to review is '045 Raspberry'. Availability: Priceline, Target, Cosmetic Fragrance stores in Australia and online at Flipkart.com, jabong.com, nykaa.com and purplle.com in India. 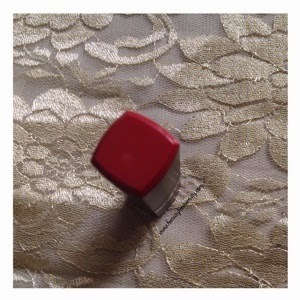 The shade name and number is written at the base and the actual colour of the lipstick is indicated at the top so it's quite easy to find this lipstick in your makeup hoard. The textured outer plastic casing ensures a good grip and gives great control during lipstick application. The cap closes with a click sound and is quite secure so worry not while travelling with this in your bag. 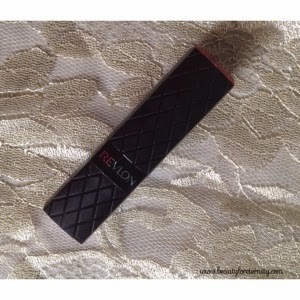 The lipstick bullet has brand name 'REVLON' engraved on it which looks catchy. 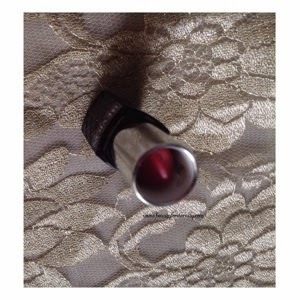 The lipstick bullet goes completely in the tube when closed so it is mess free. True to it's name, this shade is a lovely raspberry red which is ideal for everyday wear if you are a fond of red lipsticks but don't want to look like screaming "Hey ! I am wearing a red lipstick today." It is a muted brick red which will suit medium to light skin-tone but won't look so flattering on darker skin-tone. Texture: The texture of Revlon colorburst lipstick is the biggest plus point. 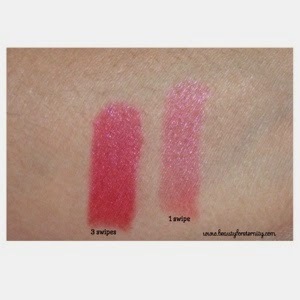 It's soft, not too creamy, moisturising and glides on the lips like butter. It does not tug or pull the lips and feels very light on the lips. I wore it on my bare lips and it performed quite well in terms of moisturisation without feeling sticky or heavy. 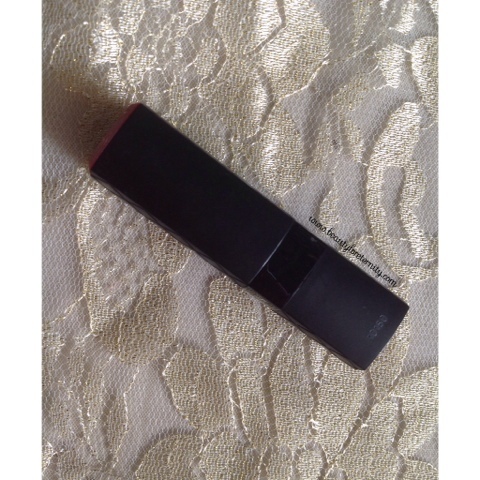 Finish: Revlon colorburst lipstick has a satin like finish with a subtle sheen. I noticed extremely fine purple coloured shimmer particles in it but these are not visible on the lips. 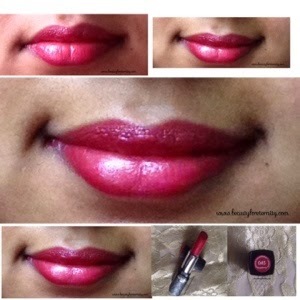 It gives a nice shine to the lips which is appropriate to be worn on everyday basis. Staying power: Revlon colorburst lipstick starts to fade away only after 2 hours being quite light in the middle and darker in the peripheral area of the lips. However it did stay for 5-6 hours before it wore off completely and left an even reddish pink stain behind which looked lovely. Application on lips: Revlon colorburst lipstick applies best when applied directly from the lipstick tube. It covers the lips evenly giving a stain like finish in one swipe. It's easy to create a crisp outline without using a lip liner which does not feather out and bleed even hours after application. Transferability: Revlon colorburst lipstick is not kiss-proof and transfers easily to glasses. It does survive 1-2 meals but keeps fading away gradually. Who should buy: People who like moisturising lipsticks with good colour pay off and subtle glossy finish which does not look over the top. Those who have medium to light skintone will love this shade as it's a lovely red to have in your lipstick collection. Appropriate occasions to wear: the shade raspberry from Revlon is a quite versatile and wearable shade and can be worn everywhere. I myself prefer it with winged eyeliner or with neutral eye makeup. Overall, I would say that it's a lovely lipstick which has good pigmentation and staying power and great moisturising formula. The shade raspberry is worth giving a try for red lipstick lovers. Yes, definitely go for Revlon colorburst lipstick for it's lovely formula, moisturising power and satin like finish which is neither too matt nor too glossy. The shade raspberry is a keeper for red lovers. I recommend this to people with fair to medium skin tone.